As you know by now, one of my passions is music. And I love meeting the artists whose music inspires me. One of those individuals is Alice Cooper, whom I was lucky enough to meet this past Friday when he was in Philadelphia with Motley Crue. Over the past few years I’ve met some fantastic musicians and celebrities. Out of all them, the two best were Barry Manilow and Paul Stanley of KISS. Why? Because they were both selfless and gracious individuals with their feet planted firmly on the ground. 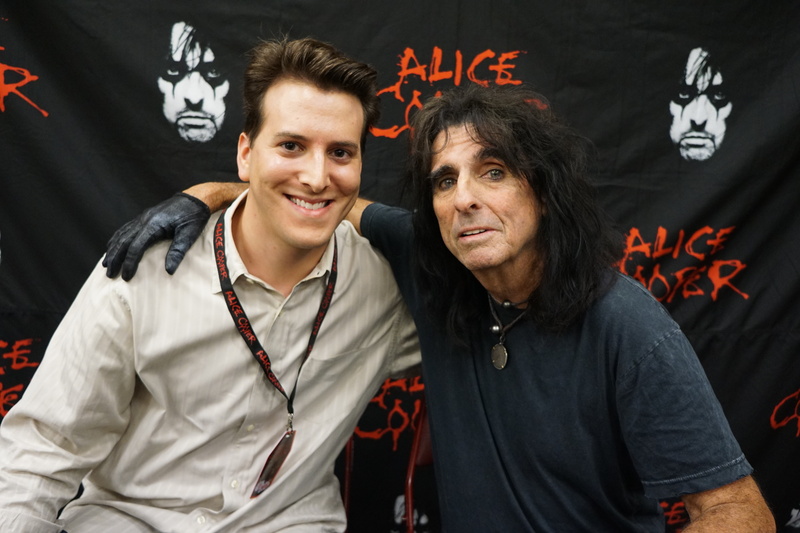 And going into this meet and greet with Alice Cooper, I had heard he was equally nice. 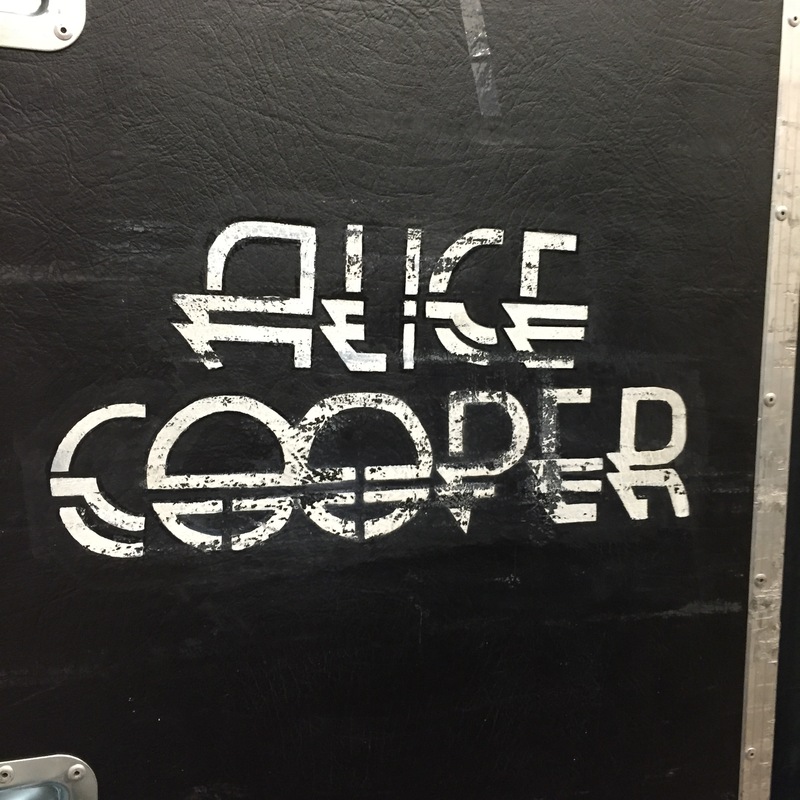 The meet and greet started after Alice played a tight set of 13 songs. 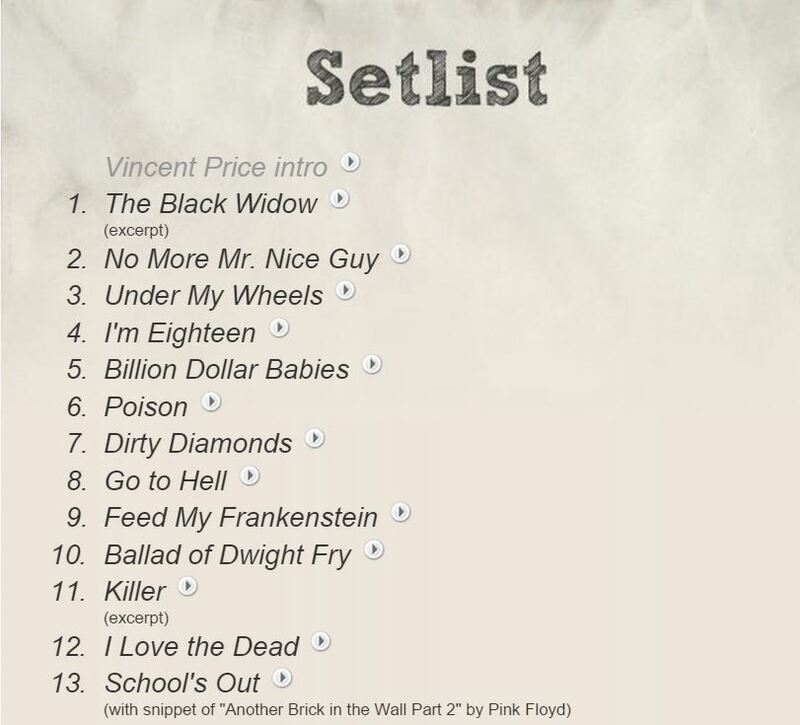 As you can see from the setlist below, he performed his biggest hits and several lesser-known tracks. But what made the performance even more captivating was the theatrics that accompanied the songs. During “Billion Doallar Babies” he came out with a sword piercing through a stack of “money” that he shook off over the crowd. Later on in the set Alice turned into a larger than life creature in “Feed My Frankenstein,” followed by a beheading. And of course, no Alice Cooper show would be complete without his trademark snake. It was a wonderful assault on the senses that is only rivaled by KISS’ stage show. 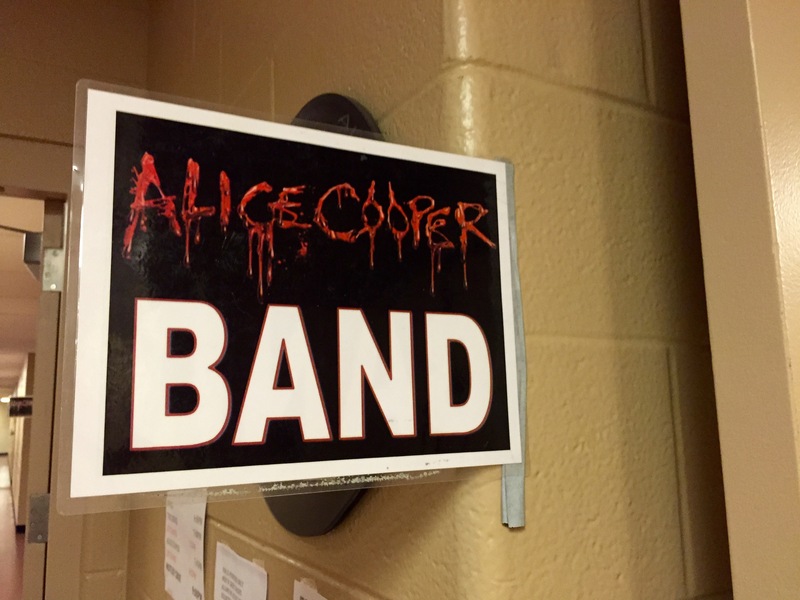 After Alice’s set came to a close, me and all the VIPs met up and were brought backstage. On our way to the room where we’d meet Alice, we ran into one of his bandmates, who cheerily gave everyone a high-five as we passed by. We were then brought into a room where they did roll call and gave everyone their merchandise bags. I didn’t realize it until after I left, but we were all supposed to get a copy of the setlist. Unfortunately, it seems the VIP organizer forgot to include this in our tote bags. But today I reached out to Alice’s assistant and he’s going to make sure I receive mine in the mail. 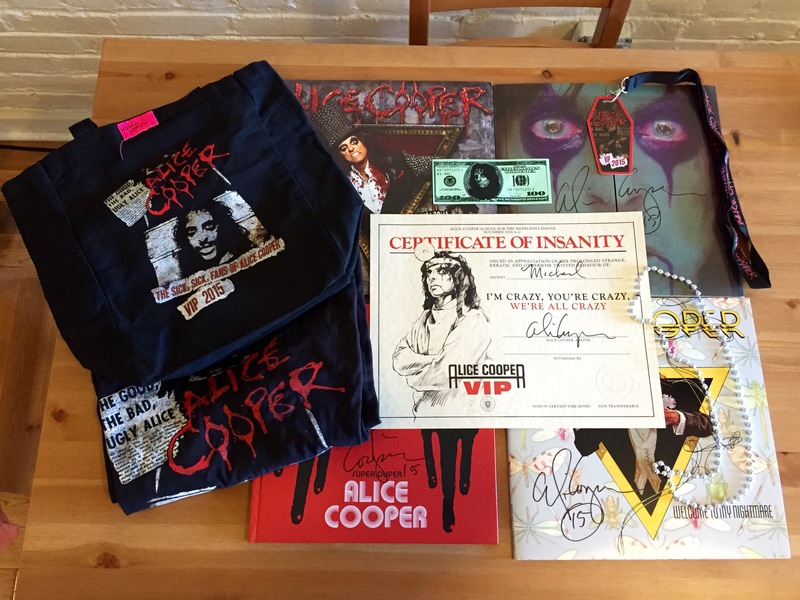 What I did receive was a cool little tote bag, a t-shirt, one of those fake dollar bills with Alice Cooper’s face on it, and a ‘Certificate of Insanity,’ which is a fabulous idea for a poster because it pays homage to the terrific Alice Cooper album From The Inside, which is a concept album about Cooper’s time in a New York sanitarium. What makes this album one of my favorites is it was written with Bernie Taupin, who is famous for writing many of Elton John’s biggest hits; this resulted in the music on this album being more melodic than Cooper’s previous work. 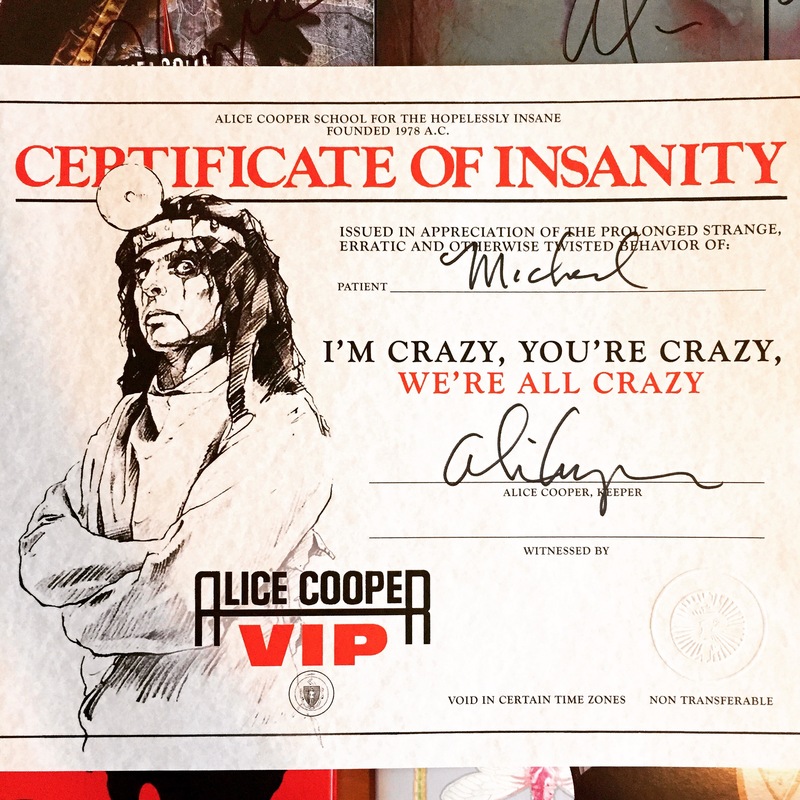 I was toward the end of the line to meet Alice Cooper, but as I made my way to the front I saw how he spent a significant amount of time with each fan. Not only did he answer questions, sign autographs and take numerous photos with people, he fulfilled specific requests. Two fans dressed as Wayne and Garth from Wayne’s World wanted to reenact a scene from the film with Alice where he’s standing and they bow before him repeatedly saying, “We’re not worthy! We’re not worthy!” Alice obliged and it was hysterical to watch. He also recorded video messages for people who couldn’t be there, including singing a short birthday message for multiple fans’ friends. I was very impressed. No one said, “We have to speed things up” or “We don’t have time for that.” However long it took, it took. Alice wasn’t rushing the fans, and no one was rushing him. It was how a meet and greet should be. When it was my turn, I came prepared with a few questions I wanted to ask Alice because he’s always been a musical artist who I wanted to interview and, once again, he obliged. Below are the questions I asked Alice and his answers. I’m a big KISS fan and I’ve interviewed Paul Stanley and Eric Singer, both of whom I know you’re friendly with. KISS fans are constantly saying they’d love to see a KISS and Alice Cooper tour. Is this something you’d consider doing? It would be a good tour. It’s one of those things where if they put it together, I’ll do it. They’re old friends of ours. We’ve known each other forever. It would be fun to do a tour with KISS. Two of my favorite albums of yours are Welcome To My Nightmare and its sequel, Welcome 2 My Nightmare. Both of these records were produced by the amazingly talented Bob Ezrin. What’s it like working with Bob? Bob and I have been working together for so long. We just did the Hollywood Vampires album together. He produced the Vampires album, and I’m in touch with Bob at least once a week. We stay in touch all the time. He’s just one of those guys…if I’m writing a song, even if he’s not producing, I’ll call him up and say: “Here, listen to this. What have I got?” We’re so close that even if he’s not producing, he’s going to listen to the songs and tell me what I have. Another one of my favorite albums of yours is From The Inside, which you wrote with Bernie Taupin. What are your thoughts on Bernie? Bernie’s my guy. I talk to Bernie all the time, too. Bernie lives up in Santa Barbara. He’s a cowboy now. He’s a cowboy. He literally has cattle. As you can see from the photo above, Alice is known for taking goofy photos with fans. I had been thinking about this photo for weeks in advance, and I’m glad it turned out so well. During these meet and greets you just look at the camera and hope for the best. Thankfully, we both look equally goofy. 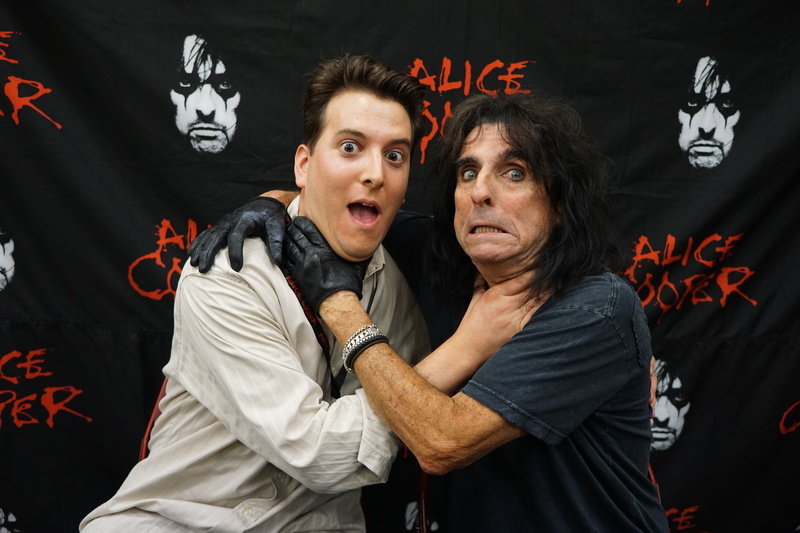 My Alice Cooper meet and greet experience was an excellent one. He was as nice as could be, I left with some great merch and autographed records, as well as a “Certificate of Insanity,” and I got to do a mini-interview with him. He also put on a hell of a show. 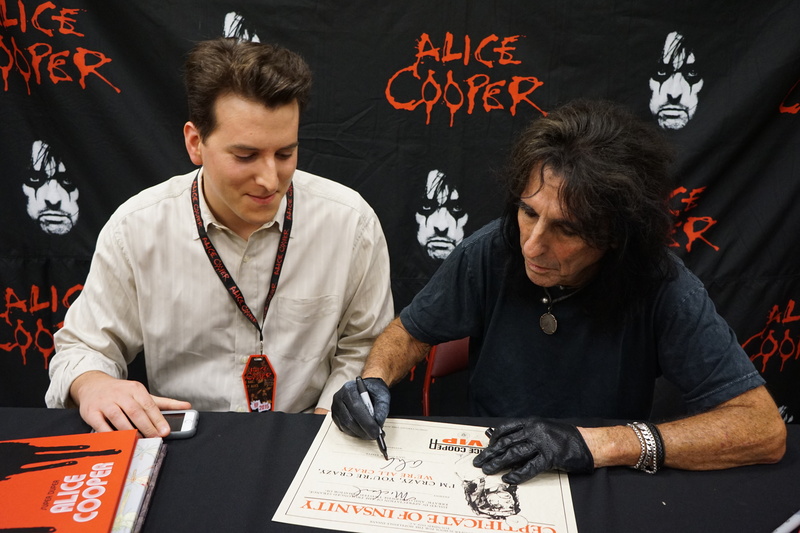 if you’ve never seen or met Alice Cooper, try to do both. He’s a great artist, a great man and an inspiration to his legion of followers. Hello, pictures taken at this meeting were with your camera or mg professionals? Thank you! you got to take some particular thing for him to autograph? It was allowed? I hope to have good luck in my meet and greet with him and Vampires! Yup. I think you can bring three or four things for him to sign. And they don’t rush you through at all. They’ll also take several candid and posed photos, so you’ll have plenty to remember the occasion. He’s one of the best meet and greets I’ve done. You’ll really enjoy it. When is your meet and greet scheduled for? I hope to be unforgettable! Thank you Michael for your attention! Awesome! Great photo with the band. Thanks for sharing!